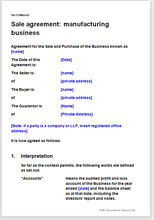 This is a comprehensive agreement for the sale of a manufacturing business by an individual, a company or any other organisation. Warranties are extensive and cover all areas of importance. The drafting notes contain a thorough explanation of how warranties work. As a buyer, you will probably be buying the property or at least taking over a lease.